Carpenter Community Charter School that is. GreatShools.net gives Carpenter Community Charter School in the Studio City Real Estate area a 10 out of 10 rating. And all the parents I've talked to sing its praises. To live within the boundaries of Carpenter Community Charter School in Studio City, or to get a waiver permit allowing your child to attend, is to be the envy of your neighbor. City-data.com school rating (using weighted 2006 test average as compared to other schools in California) from 0 (worst) to 100 (best) is 92. The API (a school's Academic Performance Index) scale ranges from 200 to 1000 and is calculated from the school's performance in the Standardized Testing and Reporting Program. A score of 800 was set by the state as the API target for all schools to meet. Carpenter Community Charter School/Carpenter Avenue Elementary School had an API growth score of 930 in 2011, and API growth score of 941 in 2012, that is the highest of the 71 elementary schools in the district. California uses the Academic Performance Index (API) to measure annual school performance and year-to-year improvement. Carpenter Avenue Elementary School's 2011 base score was 929 and the school did meet its 2012 school-wide growth target. Carpenter Community Charter School has an API score in the highest 10 percent of all schools in the state. 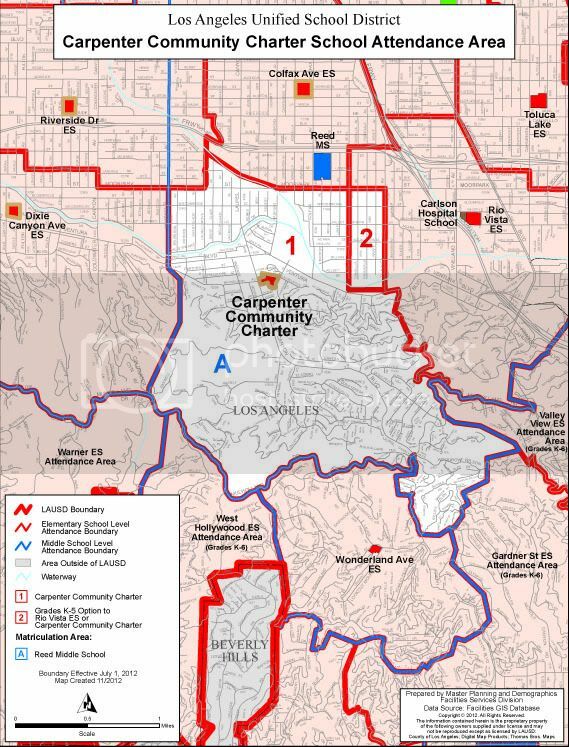 So how did Carpenter Community Charter School in the Studio City Real Estate area become a bright star shining in the rather dull constellation that is the Los Angeles Unified School District? Well, the story goes that back in the 70's and 80's, parents pulled their children out of public schools and enrolled them in private schools because of mandatory busing. In 1985 only about 65 of the 459 (half of what the school could accommodate) students at Carpenter were from Studio City. Joan Marks, (Carpenter’s principal from 1985 to 2000)knowing her school was close to being closed, set out on a campaign to save it. It worked and it continues to work today. The parents formed a fund raising organization called "Parents for Carpenter" which has become primary in the school's success, which now enrolls about 850 children and is considered one of the best public elementary schools in Los Angeles. In September, the school opened a new library that was built through the efforts of the parents' group. The library took four years and about $135,000. The "Parents For Carpenter" reached out to the businesses in Studio City, many businesses display school supporter certificates in their stores. The school also sells corporate banners acknowledging their support -- for as much as $2,500 each -- which are hung on a fence on Laurel Canyon Boulevard. One of the school's biggest corporate relationships is with CBS Studios, which is just down the street. Not only does CBS donate money to the school it also helps out with building projects. For the new library, it donated carpenters to build bookshelves and seating. If you would like to know the value of your Studio City Home In The Carpenter School District please visit http://WhatsMyStudioCityHomeWorth.com this site has very helpful tools and information for Studio City Home Owners. Do You Live In The Carpenter Community Charter School District? Very roughly, the school boundaries can be summarized as follows: Mulholland to the south, Moorpark to the North, Tujunga to the East, and Whitsett to the West. A specific address can be input at LAUSD's website. No one is guaranteed to be enrolled in Carpenter School - once the school has reached capacity. Before buying a home in the district, please check with the school ( Carpenter School ) if attending Carpenter School is important to you. The real estate market in Studio City & all of the San Fernando Valley is rapidly changing. 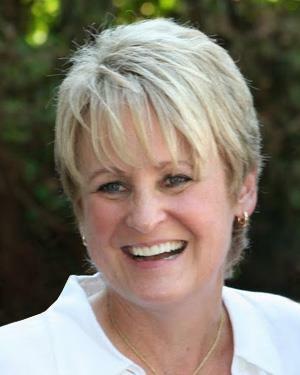 Now, whether you are buying or selling Studio City Real estate, you need a Realtor ®more than ever to help navigate through the shifting market.Whether you are buying or selling a home, hire a Realtor® like Heather Farquhar, who want to earn your business. 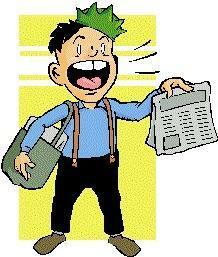 I invite you to contact me as I would be happy to assist you with this important transaction. In addition, if you have any general questions about buying or selling real estate in Studio City, Sherman Oaks, Carpenter School District and the entire San Fernando Valley, please contact us we would love to answer your questions regarding Studio City Real Estate and Carpenter School District Homes For Sale. Do You Live In The Carpenter School District? 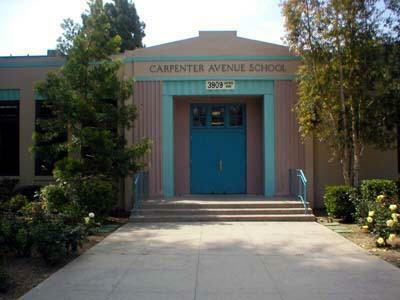 Capenter Avenue Elementary is now Carpenter Charter! Have greater autonomy over our school’s curriculum, budget, and governance. To formalize and institutionalize Carpenter’s mission and vision of providing and enriched educational program that not only meets academic standards established by the state and district, but integrates the arts, technology, physical education and hands-on learning into the instructional program. To involve the whole community (parents, teachers, administration) in the adoption and advancement of our educational program – and at the same time, to make us all accountable for results. To be able to fund innovative programs at the school to close achievement gaps, enhance learning opportunities for all students, and to develop best practices that could be adopted by other schools in the district. On June 15, 2010 the LA Unified Board of Education approved Carpenter's application and Carpenter was granted affiliated charter status for a period of five years. Over the summer, Carpenter began the conversion effort and are looking forward to their first full school year as Carpenter Community Charter. Although we do our best to narrow the search to the Carpenter Charter School District we can not guarantee that all the listings below are within the borders. Purchasing a home within the Carpenter School District does not guarantee that your child can attend the school. Please contact Carpenter Charter School for more info. Parents For Carpenter and Up-Coming Events. New Website Answers the Question "What's My Studio City Home Worth"